The past two weeks have flown by with little time to read. Yet, in the middle of all my busyness I kept stealing small snippets of time to pick up Walks Alone, even if it was simply to read another paragraph. This book was like a lazy river ride full of twists and turns that slowed my crazy mind, but entertained me all the while. Sandi Rog's descriptions of the western countryside, the Cheyenne villages, and even Denver City were beautiful. Not only did she make the scenery come alive, but she sucked you into the lives of her characters. I loved getting to know Anna and Jean-Marc/White Eagle as they took their journey toward forgiveness and love. If you haven't experienced this book, add it to your To Be Read pile! 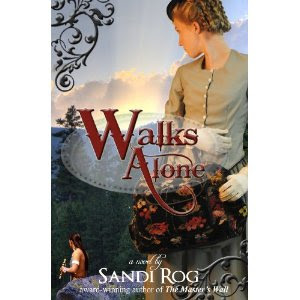 Walks Alone is currently offered as an E-book on Amazon, soon to be released in hard copy. Ooh, sounds like a great read. Thanks for the recommendation! Sounds really good. I love reading stories set in the outdoors. I'll have to look for this.